Home HSC Result 2019 HSC Result 2019 by SMS How to Check HSC Result 2019 by SMS? How to Check HSC Result 2019 by SMS? Since it is the second major system of checking the HSC Result 2019 by SMS method. Everyone check their result via online. On result publishing day eboardresults.com get over traffic to their website, then it turned quite impossible to check the result via online as it consumes too much time. So, it is better to Check HSC Result 2019 by SMS or Check Alim Result 2019 by SMS. Now, here we will share How to Check HSC Result 2019 by SMS and How to Check Alim Result 2019 by SMS. After reading this article till the end you will know to check the result via sending an SMS to 16222 number. It is a simple way to check the result after the online result checking process. The previous year about 1.5 million students sat for the HSC Exam. You can check the HSC Result 2019 Check by SMS easily. After publishing the result by the education board of Bangladesh, you have to send an SMS to 16222 number to check the HSC result 2019 by SMS method. to check it now you have to write a message in a format which is related to the result checking system. You must spend about 2.44TK from your mobile balance. You should type the message in the format below. Now, you have to send the SMS to 16222 number. By following the above format you will get your HSC Result 2019 by SMS. After doing this you will get your result. You can also check the Alim result 2019 Check by SMS as well as HSC Result 2019 by SMS. It is another way to check the Alim result 2019 by Mobile SMS. You should write a message in the format that is related to HSC Result 2019 by SMS system described above. Don't worry we're showing you a demo message below. 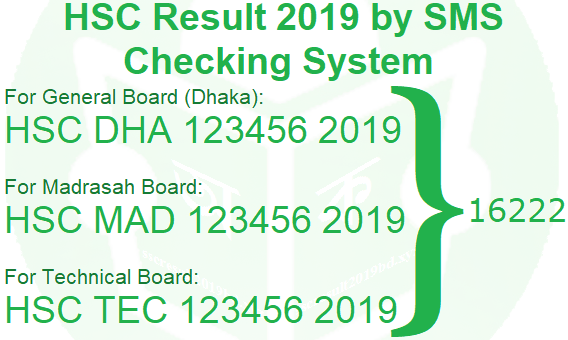 Now, send the Message to 16222 number and get the HSC Result 2019 Madrasah Board by SMS. It will cost you about 2.44TK from your mobile. But it is the fastest way to check the result by sending the message. How to Check the HSC Result 2019 by SMS? HSC<space>first three letters of your board<space>your roll number<space>your passing year, and send it to 16222 number. HSC<space>MAD<space>your roll number<space>your exam year, and send it to 16222 number. HSC<space>TEC<space>your 6 digit roll number<space>2019, after writing this in your mobile message option, send it to 16222 number. After sending the message you will get the message back from the server with your result. It will cost you about 2.44TK from your mobile main account balance. Follow the above instructions step by step and you will be able to get the HSC/Alim result via SMS. Here are some board names with a short form for you to make it easier. Type this three letter at the of typing the message. Follow the instructions above to get the result with mobile SMS system. It is the fastest way of getting the result. You can also check the result online also on our website. You can only get your GPA per subject wise result. Thank you for reading the full article with your time! You can also check your HSC Result 2019 Online and Alim Result 2019 Online, Also you can download HSC Routine 2019 from here! Just visit our website and get the result from our website. You can also like our Facebook Fan Page and get an update on facebook.